In 2011, First Presbyterian Church celebrated its 150th Anniversary. Founded in 1861 by Rev. Sheldon Jackson, our church has a rich and vibrant history. On the last Sunday in January 1861, Rev. Jackson arrived at Morton Hall in Rochester to lead the worship service for Rochester’s six Presbyterian families. On February 17, 1861, the church was officially organized. The Board of Domestic Missions appropriated $300 to support Jackson, but his independence caused many differences with board members. His personal missionary recruiting enterprise was one source of these differences. Between 1860 and 1870, he raised over $10,000 to aid missionaries and church building in Minnesota. The congregation raised $1200 for a new building, but this was not sufficient for the projected membership of two hundred fifty people. In 1865, Sheldon Jackson sought building funds in the East to supplement that money. In spite of widespread Eastern interest in General Grant’s Wilderness Campaign, he returned in the fall with five thousand dollars. Between October and December, the building was erected and enclosed. It was dedicated January 7, 1866. The first Presbyterian service in Rochester, Minnesota was held January 29, 1861. First Presbyterian Church was officially organized February 17, 1861 in Morton’s Hall on the second floor over Massey’s store, located at that time on the corner of what is now First Avenue and Third Street Southwest. There were seven charter members and it was the second of approximately one hundred churches organized by Sheldon Jackson. Other early meeting places included the lobby of the Porter House, located where the Kahler Hotel is now, and the old court house which stood near the site of the old Northwestern depot. The congregation’s first “real” home was a 36 by 60 foot frame building costing $6,000, complete with a spire and stained glass windows. The first manse was located in the rear of the church. The first service in the new building was the first Sunday in December 1865 and the church was dedicated on the first Sunday in January 1866 and was located at the corner of Third Avenue and Second Street Southwest. After meeting in several different spaces for the first few years, a frame building was constructed in the fall of 1865 at the corner of Third Avenue and Second Street Southwest. On April 22, 1930, the church was partially destroyed by fire. Even before that fire, plans had begun for a new church. The cornerstone of the new building in its present location was laid in 1931 and the sanctuary was used for the first time in March 1932. 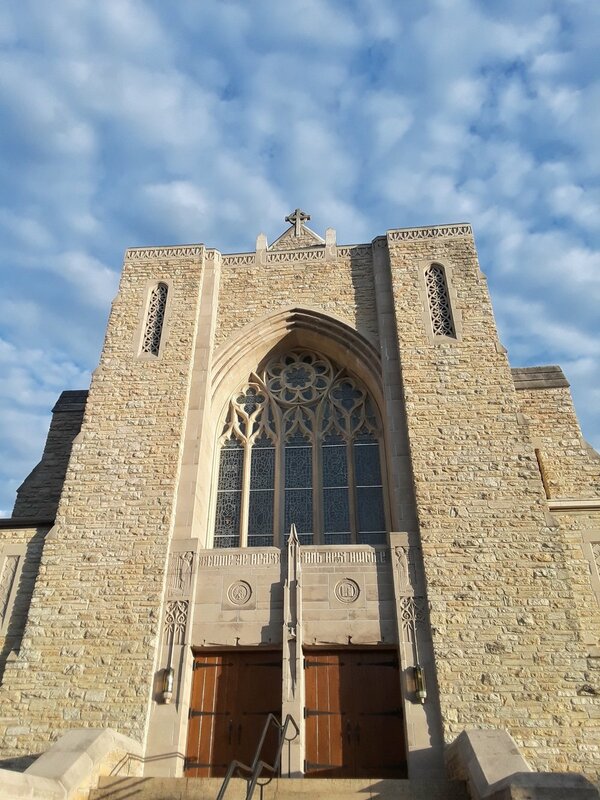 Over the years, the church has undertaken several major construction and renovation projects with the last significant project taking place in 1995. That project included purchase and installation of a new 48-rank Casavant organ plus improvements to the sanctuary. It also set aside a large contribution for mission.